Jerry Tarkanian, who was known to fans of college basketball as “Tark the Shark,” and died this week at 84, had his highly successful, yet highly scrutinized reign as the head coach at the University of Nevada-Las Vegas end in the early 1990s due to his program’s connection with the New York mob. In the wake of a three-year span where Tarkanian led his hip, high-flying Running Rebels to a 95-8 record, back-to-back appearances in the NCAA Final Four and the 1990 National Championship, the relationship between at least four UNLV players and a notorious east coast organized crime figure and convicted point-shaver resulted in his ouster at the school he put on the map. Less than two months after UNLV was upset by Duke in the 1991 Final Four, the Las Vegas Review Journal printed photos of notorious New York mob associate, Richard (Richie the Fixer) Perry, socializing in a hot tub and horsing around on his backyard basketball court with Running Rebel stars Anderson Hunt, David Butler and Moses Scurry, accompanied by a scathing expose of his various contacts with the program. The article and photos spawned another in a long line of NCAA investigations into Tarkanian-headed programs and eventually concluded in Tark the Shark’s heavily-pressured resignation from the job he had held for 19 seasons. Perry, a native New Yorker and an underworld gambling specialist linked to the Lucchese crime family, had a vacation residence in Las Vegas at the time of the UNLV scandal. FBI surveillance records from the late 1980s and early 1990s cite Perry’s frequent palling around with Running Rebels basketball players, dining and clubbing with the hoopsters at trendy Vegas hotspots, lining their pockets with cash handouts and entertaining them at his home, which featured a customized full-court basketball floor in his backyard that had the names of Hunt, Butler, Scurry and Young emblemized on the baseline. Testifying in front of the NCAA’s disciplinary committee, Tarkanian claimed that he repeatedly warned his players to steer clear of Perry because of the harm he could do to the program and their personal careers. 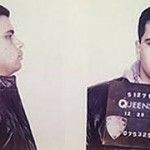 The man they called the “Fixer” got his nickname for obvious reasons: he was twice convicted for taking part in mob-backed sports fixes – first in 1973 related to manipulating the outcomes of harness races in New York and then in 1984 related to the infamous Boston College men’s basketball point-shaving scandal (nine games altered in the 1978-79 season) orchestrated by the Lucchese mob. The FBI examined allegations that Perry had UNLV players shave points on the 1991 team, ranked No. 1 in the country for the entire regular season going 30-0, however no charges were ever filed. The ’91 Running Rebels, a squad some experts were touting as the greatest ever prior to their shocking defeat in the semifinals to Duke, covered the point-spread in less than half of their games that year. Informants told the FBI that the day after the Duke game – dubbed one of the biggest upsets of all-time and the centerpiece of the game-fixing accusations -, Perry was in Atlantic City with one or more members of the Running Rebels starting five, gallivanting through a series of casinos. The line moved four points, from 10 down to 6 in the days leading up to the much-anticipated rematch of the 1990 NCAA Finals, a game UNLV drubbed Duke 103-73. Placed in the “black books” of Las Vegas and Atlantic City – officially banned from entering casinos in the two locales – Perry was convicted in 1997 of bookmaking and tax evasion in a federal case out of New York. According to law enforcement files, Perry worked directly for the Lucchese syndicate, at one point reporting to capo Paul Vario and Irish hoodlum James (Jimmy the Gent) Burke made famous by their depictions in the classic Martin Scorsese film Goodfellas (portrayed by Paul Sorvino and Robert De Niro, respectively). Purchasing property in Las Vegas in 1986, the “Fixer” immediately latched on to the UNLV basketball program, using his contacts in the tight-knit, Blue-Chip rich New York City cage community to feed the Running Rebels hoop recruits from the east coast. 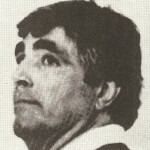 Per NCAA documents pertaining to Perry, the sleepy-eyed Tarkanian – lauded and loathed alike for filling a Father Flannigan-type role with troubled athletes he gave refuge to when nobody else would – knew what he was speaking of when he was imploring his team to keep its distance from Perry and his mob cronies. The quip-loaded and charismatic Ohio-born Armenian had been burned by Perry before. Perry was the man that brokered the recruitment of New York playground legend Lloyd (Sweet Pea) Daniels, the country’s No. 1 prep schoolboy prospect in 1987, on behalf of the UNLV coaching staff. The immensely talented but beleaguered Daniels was arrested for trying to buy cocaine from an undercover cop – charges in which Perry posted Daniels’ bail -, before he ever played a game in a UNLV uniform. Throughout the late 1980s and into the early 1990s, right up until he was revealed as a “booster” via the LV Review Journal article, Perry enjoyed VIP treatment at Running Rebels games, traveling with the team’s entourage and even sitting in Tarkanian’s reserved courtside seats on one particular occasion. 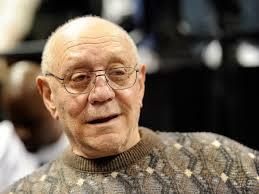 Tarkanian passed away from complications due to heart disease Wednesday. He last coached in the college ranks from 1995-2002, resurrecting the program at Fresno State, and was elected to the Basketball Hall of Fame two years ago. His career record was 706-198. 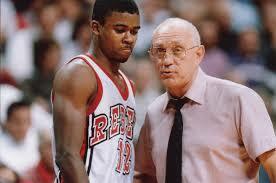 He guided his Running Rebels to four separate appearances in the Final Four (1977, 1987, 1990, 1991). In the years after he was forced out at UNLV, Tarkanian sued the NCAA for what he described as a “witch-hunt vendetta” against him, accusing them of manufacturing evidence against him in a 20-year smear campaign intended to vanquish him from college athletics. 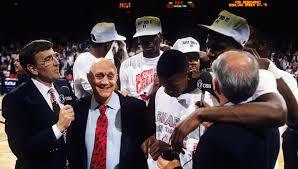 The suit was settled out of court and Tark the Shark was cut a check for 2.5 million dollars. 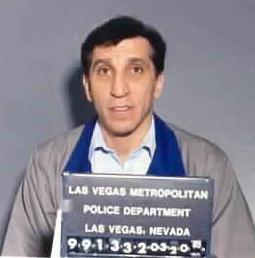 The incident involving Perry wasn’t Tarkanian’s lone brush with gangland lore: His agent and close friend Victor Weiss was killed execution style in the summer of 1979 in the hours after he had met with the NBA’s L.A. Lakers on Tarkanian’s behalf to try and negotiate a deal for him to become the franchise’s new head coach that never came to fruition. Weiss, a reputed mob associate and sometime social-companion of Las Vegas mafia chief Anthony (Tony the Ant) Spilotro, was discovered shot twice in the back of the head, his hog-tied corpse stuffed in the trunk of his Rolls Royce in a North Hollywood parking garage. About to turn 71, Richie “The Fixer” Perry is reportedly living in Florida and still operating a sports book for the Luccheses, per Dade County Police intelligence unit records.